Your child will love the party and so will you! Create an unforgettable birthday party with the Downers Grove Park District's Birthday Party Service. Just invite the guests and leave the planning and mess up to us! All themed parties are filled with a variety of games and activities. Registration is required at least two weeks in advance. Call now to make arrangements for a memorable birthday celebration. Party planning begins upon full payment. Parties are held at the Lincoln Center unless otherwise noted. Call (630) 963-1300 to book. 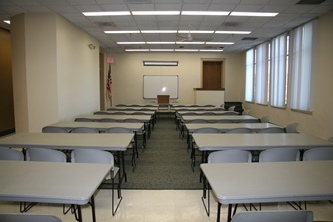 This conveniently located community center offers room rentals for groups of 10 to 120 people. Perfect for business meetings, seminars or group gatherings. Amenities at this facility include an auditorium, gymnasium and newly renovated kitchen. Listed below are room rates applicable for rentals conducted within *Lincoln Center's Hours of Operation, room capacities and various equipment available for rent at Lincoln Center. Room capacities and styles listed are most requested. *A $40 per hour charge applies for all rentals conducted outside of the facilities established Hours of Operation. Monday - Friday 8:30 a.m. - 10:00 p.m.
Sunday 10:00 a.m. - 5:30 p.m.
A security deposit is required for each room rented. Deposit amount will be determined by room size and amenities offered. The following equipment is available for rental in conjunction with facility rentals and is based on availability. A separate deposit may be required. *For pitching machine & electronic scoreboard rentals a staff operator is available for $15 per hour. Click on each setup style below to get an idea for your specific event needs.